Cook farro: Rinse and drain farro. There are many, many ways to cook farro and any of them work here. You can follow the package directions on any farro you buy for best results. On the stove: If you plan to cook this on the stove and want to save time, you can presoak the grains overnight in their 3 cups of liquid and they should then cook in only 10 minutes of simmering. Otherwise, simmer the farro in water or broth for about 30 minutes, until quite tender. Drain any excess liquid. Transfer farro to large bowl. In a rice-cooker: I cook mine on the quick setting and have been very happy with the results. Drain any excess liquid once the farro is tender. Transfer farro to large bowl. In the oven: Heat oven to 425 degrees. Brush a large baking sheet with 2 tablespoons olive oil. Spread florets in one layer, drizzle with 1 more tablespoon olive oil and sprinkle with salt and freshly ground black pepper. Roast for 20 minutes until lightly browned and crisp-tender (they will finish baking with the farro). Reduce heat to 400 degrees. One the stove: Heat 2 tablespoons olive oil in a large saute pan over medium-high heat. Add half the cauliflower and cook, tossing occasionally, until lightly browned and tender, about 6 to 7 minutes. Add to bowl with farro. Repeat with more olive oil and second half of cauliflower, then add to bowl. Heat oven to 400 degrees. Assemble casserole: Add the sage, capers, garlic, lemon zest, red pepper flakes, 1 teaspoon salt and 1/2 teaspoon black pepper to cauliflower and farro and stir to combine. Stir in fontina. Transfer half of the mixture to an oiled 10-inch ovenproof frying pan or equivalent baking dish. 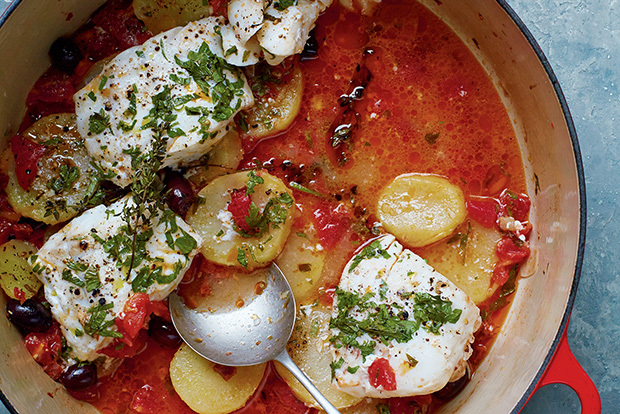 Dollop rounded tablespoons of ricotta all over. 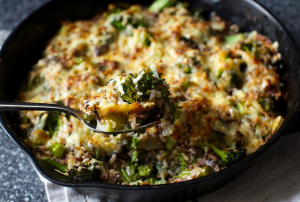 Sprinkle remaining cauliflower and farro over the ricotta, leaving the pockets of it undisturbed. In a small dish, combine panko with pecorino, parlsey and 1 tablespoon olive oil until evenly mixed. Sprinkle over cauliflower and farro. Bake casserole: For 20 minutes, until browned and crusty on top. Dig in. Do ahead: Farro can be cooked up to 3 days in advance, kept in an airtight container in fridge. Cauliflower can be cooked 2 days in advance. 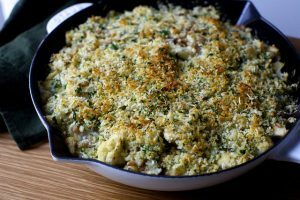 Casserole can be assembled and baked a day later, easily, although the crumbs might lose their crisp from absorbing the moisture below if not added right before baking. 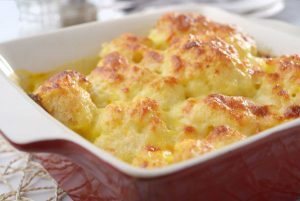 Casserole keeps for several days in fridge and longer in freezer. In Northern Italy, pizzoccheri are short, flat buckwheat noodles cooked with cabbage and potatoes and layered with cheese.You may need to use fresh lasagna sheets cut into noodles (buckwheat noodles can be hard to find) and bake them in a gratin dish with a crispy bread crumb topping. Step 1 Preheat the oven to 350°. In a small skillet, melt 6 tablespoons of the butter with the sage, poppy seeds and caraway seeds and cook over moderate heat, stirring, until nutty and fragrant, about 5 minutes. Transfer to a bowl. Step 2 Meanwhile, bring a large pot of salted water to a boil. Add the potato and cook until tender, about 5 minutes. Using a slotted spoon, transfer the potato to a bowl. Add the pasta to the pot and cook, stirring, until al dente, about 2 minutes. Using a slotted spoon, transfer the pasta to a colander. Add the cabbage to the pot and cook until just wilted, about 3 minutes. Drain the cabbage and shake out the excess water. Pour off the water and return the cabbage to the pot, along with the pasta and potato. Add the browned butter, season with salt and pepper and toss well. Stir in 1 cup of the Fontina and half of the Parmigiano and transfer the mixture to a 9-by-13-inch baking dish. The unbaked gratin can be refrigerated overnight. Bring to room temperature before baking. Preheat oven to 350 degrees. Sprinkle the eggplant slices with salt, place in a single layer around a colander set over a bowl, and let stand for 30 minutes. Rinse eggplant, drain, and squeeze dry, pressing out excess moisture and patting with paper towel. Removing excess moisture helps make it easier to roll the balls. Meanwhile, spread 1 1/3 cup breadcrumbs in a single layer on a rimmed baking sheet. Bake until dried and just turning golden, 5 minutes. Let cool. Heat 1 tablespoon oil in a 10 inch cast iron skillet over medium-high heat. Add half the eggplant in a single layer; cook, flipping one time, about 5 minutes. Transfer to colander. Repeat adding another tablespoon of oil and second half of eggplant. If pan gets too hot, adjust heat. Wipe out pan. Let eggplant cool slightly in colander. Transfer eggplant to a food processor, discarding any extra juices that drained out. Add toasted breadcrumbs, Parmesan, and minced garlic. Pulse until mixture is a chunky paste, about 6 pulses. Transfer to a bowl. Season with salt and pepper. Stir in egg white. Chill until cold, about 30 minutes. Form mixture into 12 balls, coating the outsides with remaining breadcrumbs to help shape the balls. Chill at least 1 hour until firmer and cold and up to overnight. Best results with an overnight chill. Preheat oven to 425 degrees. Heat 2 tablespoons oil in a 10 inch enameled cast iron casserole or cast iron skillet over medium-high. Add meatballs working in two batches; cook, turning carefully with a spoon to help retain shape, until browned all over, about 6 to 7 minutes. If pan gets too hot, adjust heat. Transfer to a plate. Add remaining tablespoon oil and sliced garlic; stir until fragrant, 30 seconds. Add tomatoes, a large pinch of red pepper flakes, and 1/2 teaspoon coarse salt; bring to a boil . Return meatballs to pan; spooning sauce over to coat. Bake until sauce is slightly thickened, 18 minutes. Remove casserole from oven. Set oven to broil. 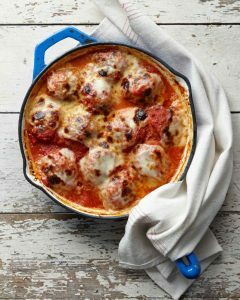 Top each meatball with a piece of mozzarella; return to oven. Broil until cheese is bubbly and golden in spots, about 3 to 4 minutes. Fill a large pot with water and bring it to a boil. Add a pinch or two of salt, followed by the cauliflower florets. Let them cook for five to six minutes ñ you want them to be tender but still firm. Drain the cauliflower and set aside. While the cauliflower is cooking, melt 2 tablespoons of butter in a medium saucepan over low heat. Add the flour and stir the mixture with a wooden spoon for about two minutes. Then, add the hot milk and stir everything until it starts to boil. Whisk the milk for about a minute, until it thickens, and then take it off the heat. Add a pinch of salt and pepper, cayenne, Parmesan cheese, and 1/2 cup of Gruyere. Stir everything together until blended well. Spray an 8×11 baking dish lightly with cooking spray, then add about 1/3 of the sauce mixture to the dish. Then, add all of the drained cauliflower, followed by the rest of the sauce. Mix the remaining Gruyere cheese with the bread crumbs and sprinkle the mixture on top of the dish. Melt the remaining 2 tablespoons of butter and drizzle over the top as well. Sprinkle salt and pepper over top and bake for 25 to 30 minutes, until the top is browned. Bring a large pot of generously salted water to boil. Heat 1 tablespoon olive oil in a large pan or skillet over medium heat and saute mushrooms, seasoned with salt and covered, for 15-20 minutes, or until softened. Stir occasionally and reduce heat if mushrooms start to burn. Add spinach to mushrooms and pour in lemon juice. Cook until wilted, then add walnuts. Cook pasta according to packaging directions, or until al dente. Drain (reserving 1/2 cup pasta water) and set aside. 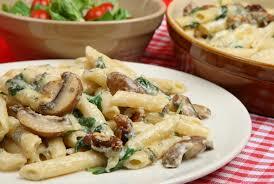 Add heavy cream to the spinach and mushrooms, stirring well, and mix in Parmesan cheese. If sauce is too thick, add pasta water one tablespoon at a time. Pour drained pasta into the sauce and toss well to coat thoroughly. Cook on low heat for 5 minutes, or until sauce thickens and sticks to pasta. Saute first 3 ingredients in olive oil until tender. Combine zucchini mixture, rice, sour cream, cheddar cheese, 2 tablespoons Parmesan cheese, breadcrumbs, salt, pepper, and eggs in a bowl; stir gently. Spoon zucchini mixture into a 13 x 9-inch baking dish coated with cooking spray; sprinkle with 2 tablespoons Parmesan cheese. Bake at 350° for 30 minutes or until bubbly. dmv note: I halved the recipe, used yellow squash and cubed brie it was quite tasty. Heat 2 teaspoons olive oil in a large skillet over medium heat, and cook and stir the sausage until browned. Transfer the cooked sausage to a large baking dish. 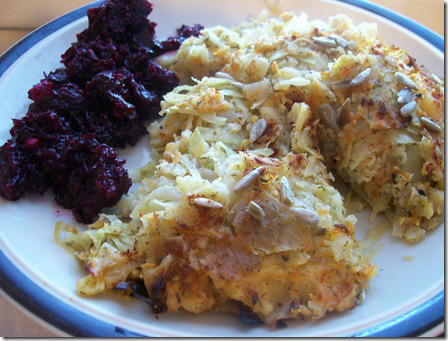 Pour 1/4 cup of olive oil into the skillet, and cook the potatoes, stirring occasionally, until browned, about 10 minutes. Place the potatoes into the baking dish, leaving some oil. Cook and stir the green and red peppers and onions in the hot skillet until they are beginning to soften, about 5 minutes. Add the vegetables to the baking dish. Pour wine and chicken stock over the vegetables and sausage, and sprinkle with Italian seasoning, salt, and pepper. 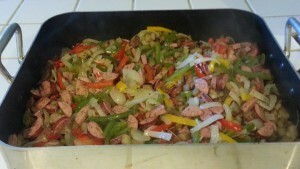 Gently stir the sausage, potatoes, and vegetables together. Bake in the preheated oven until hot and bubbling, 20 to 25 minutes. Serve hot. notes: I made a few changes due to what was in the kitchen. Less cottage cheese though close to 1.5 c. that was all I had, more cabbage than 4 c. but not much more, 1/2 c sour cream as it’s full fat and I would have felt guilty using a whole cup, no sunflower seeds as mine were dead, was going to use 1/2 c of ricotta but it was 6 months out of date. I sprinkled paprika over the top even though I’m not a big fan. Scrub, don’t peel, the potatoes and cut them into small pieces. Boil until mashable. Drain and mash, while still hot, with cottage cheese, sour cream and yogurt. Saute onions in butter with 1/2 tsp. salt. After 5 minutes, add cabbage and remaining salt. Saute until cabbage is tender. Combine with potato mixture, and add everything except 2 tablespoons of the sunflower seeds and the paprika. Taste to correct seasonings. 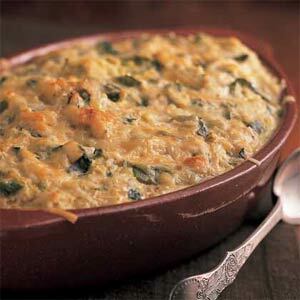 Spread into a deep, buttered casserole and top with paprika and remaining sunflower seeds. Bake at 350 degrees, uncovered for 35-40 minutes. Heat the oven to 350°F (175°C). In a medium saucepan of boiling water, cook the potatoes until tender, about 20 minutes. Drain and let cool slightly, then peel and cut into slices 1/4 inch (6 mm) thick. In a medium enameled cast-iron casserole, spread the potato slices, tomatoes, chorizo, olives, and garlic. Set the fish on top and add the thyme, parsley, butter, oil, and lemon juice. Season with salt and pepper. Cover and bring to a simmer on the stove, then transfer the pot to the oven and cook until the fish is just opaque throughout, 10 to 15 minutes. Serve directly from the casserole. The casserole can be assembled and refrigerated for up to 4 hours before baking.